This Saint Patrick's day promises to be spectacular in Limerick with an estimated 70,000 people lining the streets on Tuesday the 17th of March for the Saint Patrick's Day Parade. We here at Pery's Hotel have also organized a family day out packed full of "Craic agus Ceol". 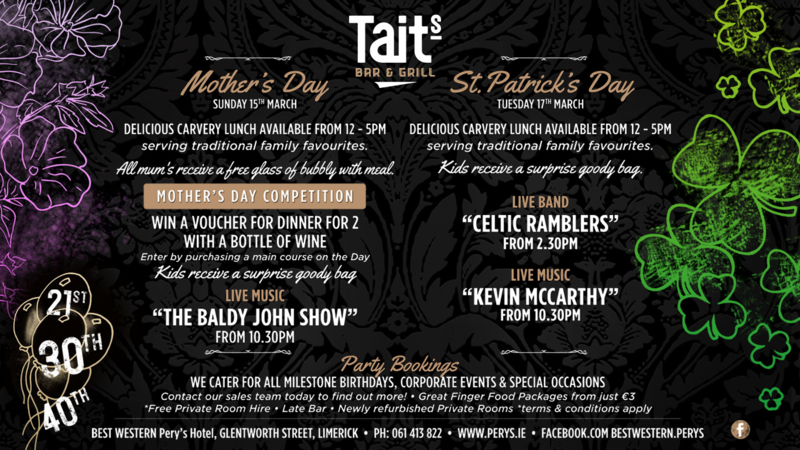 After experiencing the excitement of the Saint Patrick's Day Limerick Band Parade, call in to us for our delicious carvery style lunch serving traditional family favourites from 12noon until 5pm. And not to forget the kiddies, who will receive a surprise lucky bag on the day. Tait's Bar and Grill will be serving their newly designed authentic menus again from 6pm until 9.30pm. Delicious bistro style cuisine at it's best! Don't forget to join us in Tait's Bar and Grill from 2.30pm to experience our extremely popular Live Band "The Celtic Ramblers". We have Live Music again that evening from 10.30pm with Limerick's well known musician "Kevin McCarthy".